Welcome to the online home for the bestselling new book, The Sober Truth, an exposé of Alcoholics Anonymous, 12-step programs, and the rehab industry–and how a failed addiction-treatment model came to dominate America. AA has become so infused in our society that it is practically synonymous with addiction recovery. Yet the evidence shows that AA has only a 5-10 percent success rate–hardly better than no treatment at all. Despite this, doctors, employers, and judges regularly refer addicted people to treatment programs and rehab facilities based on the 12-step model. 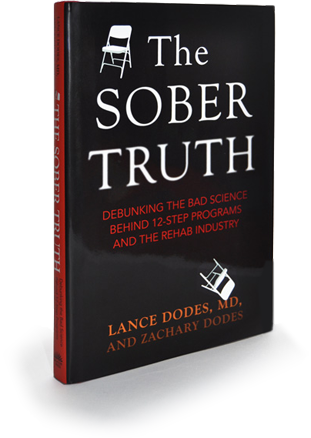 In The Sober Truth, acclaimed addiction specialist Dr. Lance Dodes exposes the deeply flawed science that the 12-step industry has used to support its programs. Dr. Dodes analyzes dozens of studies to reveal a startling pattern of errors, misjudgments, and biases. He also pores over the research to highlight the best peer-reviewed studies available and discovers that they reach a grim consensus on the program’s overall success. But The Sober Truth is more than a book about addiction. It is also a book about science and how and why AA and rehab became so popular, despite the discouraging data. Dr. Dodes explores the entire story of AA’s rise, from its origins in early fundamentalist religious and mystical beliefs to its present-day place of privilege in politics and media. The Sober Truth includes true stories from Dr. Dodes’s thirty-five years of clinical practice, as well as firsthand accounts submitted by addicts through an open invitation on the Psychology Today website. These stories vividly reveal the experience of walking the steps and attending some of the nation’s most famous rehabilitation centers. The Sober Truth builds a powerful response to the monopoly of the 12-step program and explodes the myth that these programs offer an acceptable or universal solution to the deeply personal problem of addiction. This book offers new and actionable information for addicts, their families, and medical providers, and lays out better ways to understand addiction for those seeking a more effective and compassionate approach to this treatable problem. Click here to share your experiences in addiction treatment. Good or bad, personal or professional, I am keenly interested in what you have been through and how you found your way to this site. From time to time, I plan to feature these stories on my blog, with each author’s permission. The Sober Truth is available from these sellers. This space will soon become a launch point for advocacy to change our national paradigm for addiction treatment. Check back soon!